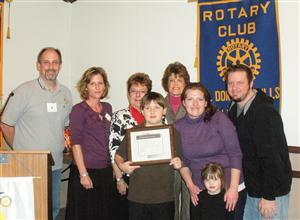 Gabe Stribik, 5th grader at Brooks Elementary School, was honored at the Jan. 12 Rotary meeting. Gabe's teacher for the 4th and 5th grades, said Gabe has blossomed from a shy boy to fully participating in class activities. "He has developed great self-confidence," she said. Gabe, his mother, Jessica, 3-year-old sister, Paige, and father, Laszlo, are in the front row. In the back row, left to right, are club president Bill Tobin, Brooks 5th grade teacher Heidi McFarlin, principal Kathi Jensen and Rescue Union School District Superintendent Terry Wenig.